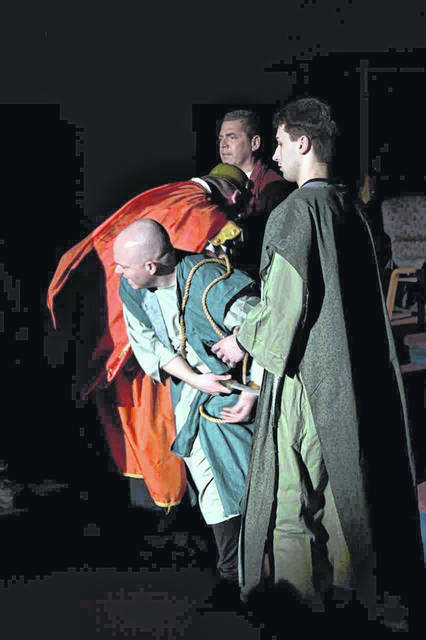 Chris Beaver, portraying Apostle Peter, reacts during the rehearsal of “The Message A.D.” Also pictured are, left to right, Nathan Graham, who is a soldier, Barry Zerkle, who is Jesus, and Spencer Hina, who is James. 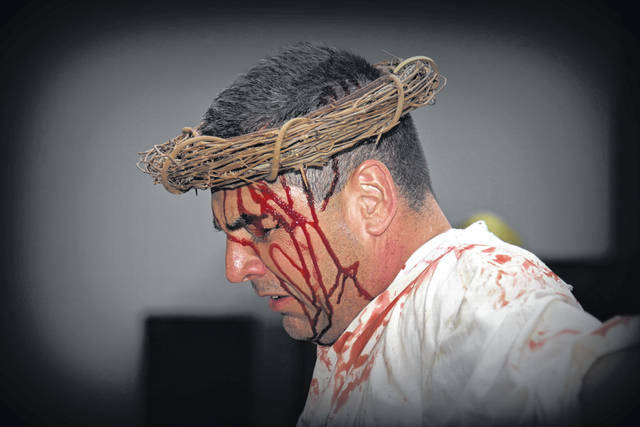 Jesus is portrayed by Barry Zerkle in “The Message A.D.,” which will be presented by Sidney Apostolic Temple. 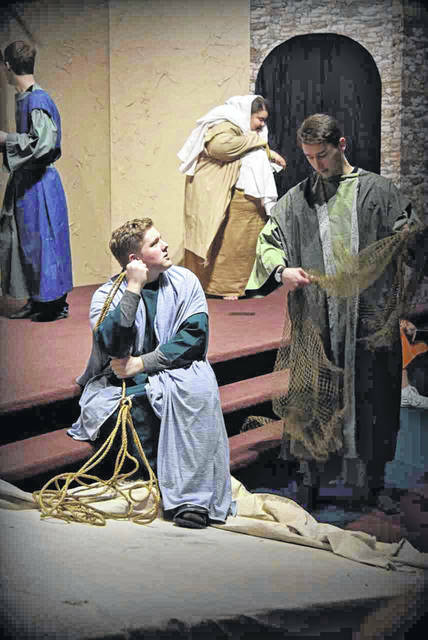 Austin Clack, who is portraying Apostle John, looks at Spencer Hina, who is portraying James, during a rehearsal of “The Message A.D.” In the background is Sarah Beck, who is a maiden in the play. SIDNEY — “It is Finished,” Jesus cried as he offered himself as the sacrifice and died. The Sidney Apostolic Temple is encouraging residents to step back in time to Jerusalem with “The Message A.D.” Those attending the performance will feel as though they are at the marketplace alive with sights and sounds of animals and people moving about, conducting business. They will witness a re-enactment of the miracles of Jesus, the love he gave, the lives he touched and changed forever. Anticipation builds as the drama leads to His death, burial, and resurrection as well as the commission he gave to his disciples. With more than 60 cast members, visual effects and music, the story of Easter will touch you at the temple. Tickets are free but seating is limited. Previous Easter dramas at the temple have filled up fast, and seating availability will not last long. The drama does include live animals, loud sound effects, darkness, violence and blood so it is not recommended for children under the age of four. The Sidney Apostolic Temple is located at 210 S. Pomeroy Ave. Performance dates include Friday, April 12, at 7:30 p.m., Saturday, April 13, at 7:30 p.m., and Sunday, April 14, at 7 p.m. People can reserve the free tickets at www.templeministries.net. Instructions are listed on the homepage. Due to limited seating, you must reserve your seat to attend. Doors open 45 minutes before each performance. Seating arrangements are on a first come first serve basis.